Please bear with me as I'm a complete n00b to OMV, but here's my inquiry. I have (4) HDDs in RAID5 with the OMV OS installed on a separate SSD. I have a video, pictures and music directory created and shared on the root filesystem of the four HDDs. 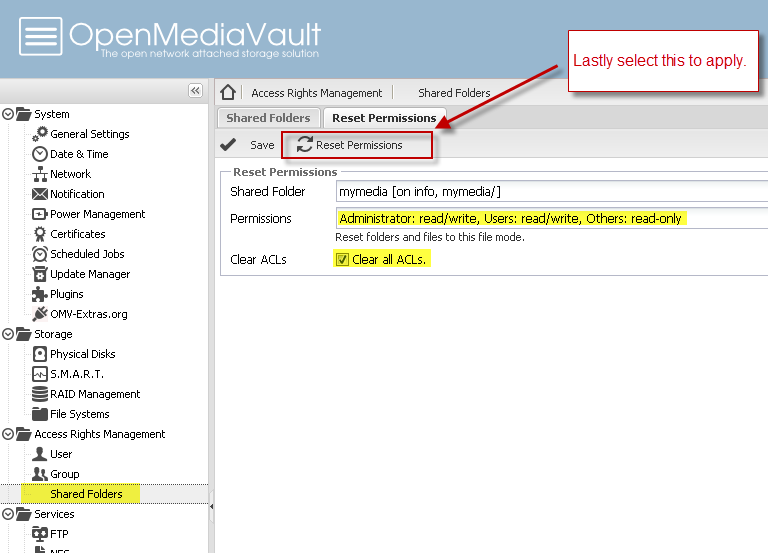 The folders have permissions and ACLs to only allow specific users to edit, but all can view. I'd like to be able to stream my videos from my OMV NAS to my Roku (I suppose via Plex or miniDLNA). How do I go about installing Plex or the required plugins to make this happen. I've searched the forums but only found topics that pertain to errors relating to PlexMS, not a n00bie walkthrough to install it. From what I've loosely gathered I need to use the root user and apt-get install the plugin via a specific repo, but I don't know. Any help would be greatly appreciated. Thank you. Now that I look at it...I think I installed OMV 2.0.13...sigh, oh well. You need to install OMV Extras. 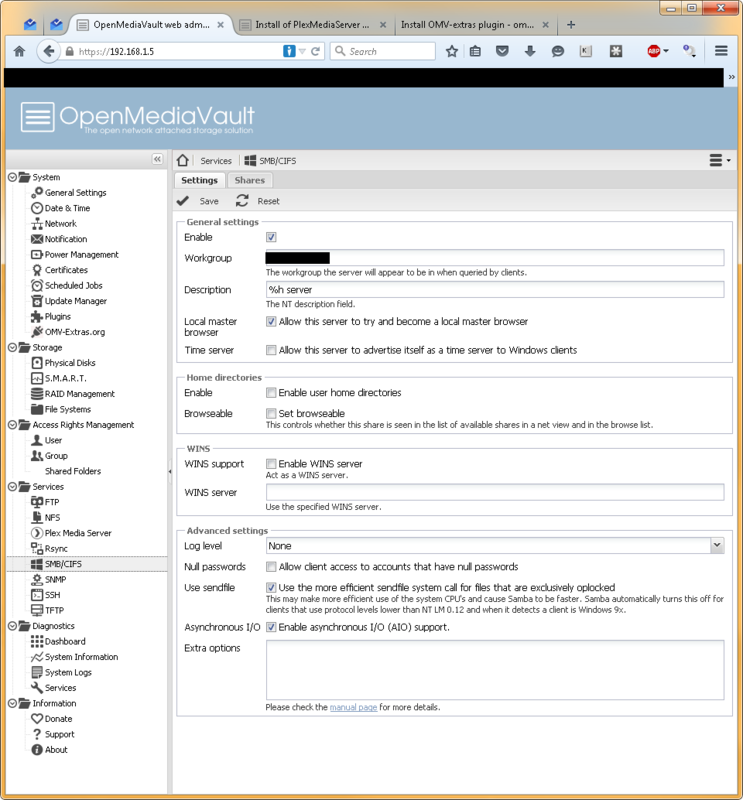 Then in OMV's web gui you need to enable repos and then you will find the plugins in the plugin section. I shared that directory via Shared Folders and SMB/CIFS yet as a normal LAN user couldn't place files in that directory. I backed up and created a shared folder within that /media/d86*/plexmediaserver/ called Videos that I can copy videos to via the SMB. I set the PMS to look in that directory (see pic attached) and I still can't see any MP4 or AVI files via the PMS -- "The library has no content yet. Click here to add content to the library." Where might I be going wrong? Thank you. Give me the output of that stat command. Also, get rid of the ACL man. Take it off. Use privileges. Always try to use privileges first. Only use ACL when you have no other choice. 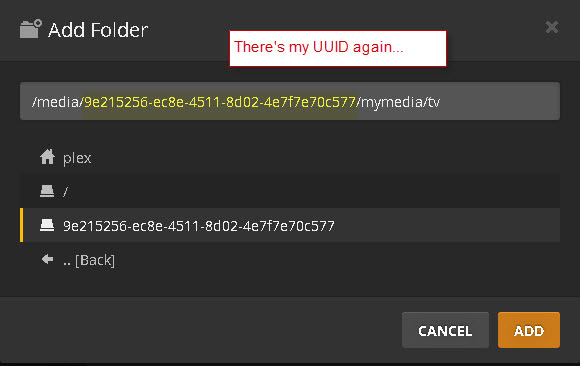 I have removed the Videos folder and created a media directory as instructed (/media/UUID/media). Noted on ACLs and privileges. Thank you so much for your guidance and patience I really appreciate it. Is that the stat of the old folder that you made???? The media folder you should have used the default drop down when you created the shared folder. Are you creating a shared folder just with SAMBA??? @ryecoaaron we so need a video on this. It gets so old. So having nothing else working on the OMV server I reinstalled OMV OS (plus I was running into a wall where the PlexMediaServer appeared to have a corrupt database?, anywho) and figured I'd document my attempt from the get go. These are parameters that are unique to my configuration, if you see these please replace with you appropriate information. 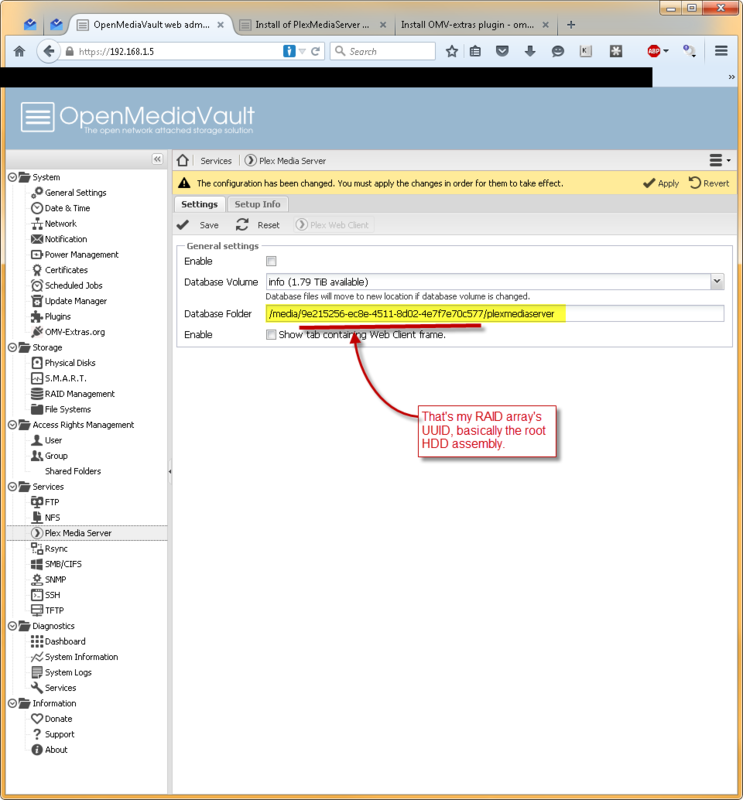 2) Download the omv-extras plugin to your local PC > (web GUI) System > Plugins > Upload (button) > select the newly downloaded *.deb file. 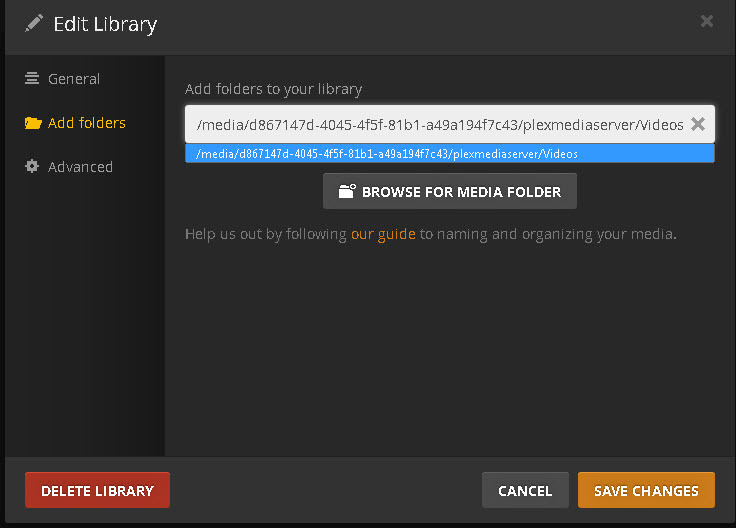 7) Your Database folder will be updated from the /var/lib/plexmediaserver to /media/UUID/plexmediaserver This folder is the root directory for the Plex Media Server application. DO NOT install anything within this folder, think of it as the equivalent to "C:\Program Files" on windows. All the important stuff is in there to make the magic happen. 11) Create a user if necessary. I'll assume you can do that via the web GUI. 12) Now via your windows PC go to the newly shared mymedia (or whatever you called it) directory and create the sub-directories as desired. 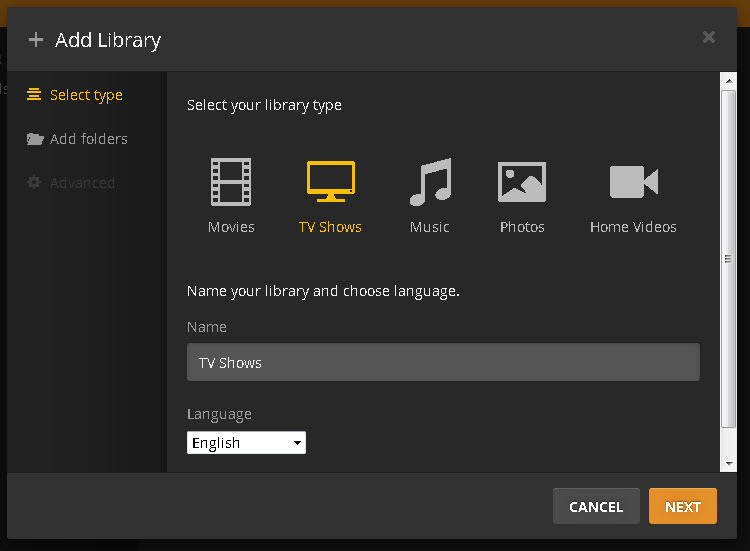 I personally followed suit with Plex Media Server and added - music, tv, movies, pictures, and home_movies. But you can organize it as desired. Put just a file or two of a TV show or music mp3...etc. in the directory for testing/validating purposes. Hope this helps & thanks a million tekkb, I couldn't have done this without your guidance and patience. Cheers! Also, if I've done something silly, please do call me out. But at present I managed to get the tv directory working and assume (danger!) that the others will work accordingly. Thanks a million! Good job, you set it up almost exactly as I do. The only difference is the media share name and the recycle bin, which I do not use. I'm running into the issue that newly user created (via Samba) sub-directories and files cannot be edited/deleted after the fact; from both the creator PC and a fellow user's PC. I thought having the "Honor existing ACLs" would default the new folders and files to the parent folder's rights. I tried to test this on a completely separate folder, that was 100% public (Permissions = "Everyone: Read/Write" at inception; SAMBA = Public: "Guests Only"; SAMBA = "Honor Existing ACLs") but even still newly created sub-directories couldn't be deleted or modified as I didn't have permission. Any ideas? Thanks. Do not create folders in the Samba section. 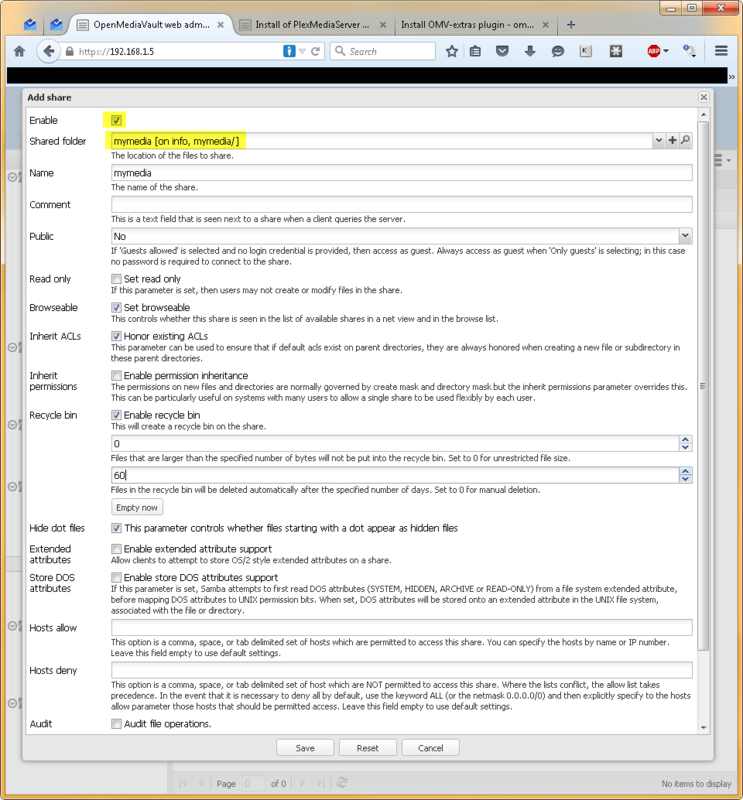 Do it only in shared folders and then share it in the samba section. ACL's are bad. Avoid them unless absolutely necessary. Edit: well since it posted, I'll upload my pictures and fixes as I've encountered it this evening. Thanks. I am trying to approve your reply but it is not working. We have had problems with spambots. Can you look at this post above? I tried to approve it but it still stays hidden. I can not approve the post, something is getting wrong. @smokingplatypus please post this message again. Okay, here goes for the fourth time as best as I can remember. So the lesson that fellow greenhorns should take to heart is that if they are having R/W problems on their server via Samba, it may be the default nature of Samba (755), which " all your files will not be writable by other than you. Other users might read it." 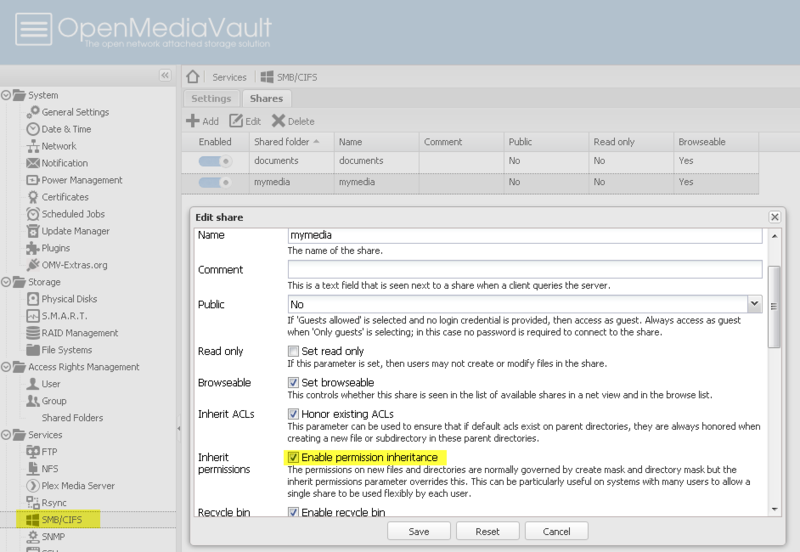 So to correct that, the simpliest way to to reset the ACLs (assuming you've done the prior steps to get Plex up an running) and use the Reset Permissions option via the previously installed OMV-extras.org plugin. 3) Now the most important step...reboot the server. After you do this, you should, in theory based on my limited understanding have the aforementioned permissions (not privileges) for the desired folder accessible via Samba. Just tested it on my roomie's PC to see if it worked, and yes it resolved my follow up issue. Hope this helps someone else. Thanks again everyone! The post was edited 1 time, last by subzero79 ( Jul 10th 2015, 9:10am ). "Your post requires manual approval and will not be approved until then." oh well that's the fourth time I've narrated that post and it's failed. I´ve tried to approve both - at least there is no error message. After a page reload, they come up green again. The post was edited 1 time, last by WastlJ ( Jul 10th 2015, 10:23am ). thank you WastIJ, it looks like it's displaying now. The post was edited 1 time, last by ermac ( Nov 16th 2015, 3:45am ). The post was edited 3 times, last by tekkb ( Nov 16th 2015, 4:37am ).